Is regional literature still a useful category? Has local color gone the way of the local newspaper? These are the kinds of questions begged by the anthology New Poetry from the Midwest, edited by Okla Elliott and Hannah Stephenson. Elliott and Stephenson have aimed to gather poems that represent the breadth of contemporary poetry by Midwest writers, and to accomplish the task they cast a wide net, including poets born in, educated in, or living in the Midwestern states. As the editors point out, many of the things we know or believe about the Midwest do not apply to the poems they have collected in this volume. As a native Midwesterner, I can confirm that people from the so-called flyover states tend to smile more readily than my neighbors in New England, but these poems are not “shy, demure, polite, nice-for-the-sake-of-being-nice, simplistic, predictable, wholesome.” The editors’ most cogent point about the Midwest as a category is that in our national imagination, the region is characterized by sincerity, and many of the collected poems have this quality, though their earnestness is not simplistic. Less convincing are the hints that a taxonomic impulse or a haunted feeling that arise in multiple poems might somehow be related to their Midwestern-ness, and the editors back off of making these observations about the poems into assertions about the category. Perhaps more important than bringing news from these well-established poets, New Poetry from the Midwest introduces readers to writers who have just published or who have yet to publish a first book. Amorak Huey’s “She Blinded Me with Molecular Nanotechnology” reflects on married love against a backdrop of environmental disaster. The gap between the speaker’s language and his wife’s scientific discourse gestures toward larger attempts at and failures of communication: “We need a special microscope / to talk to each other anymore.” In “The Apostate’s Addendum” Zachariah McVicker also considers the confusing mechanisms of love—in beggars who “blind their children // So they’ll have more to eat” and lovers who can’t tell whether they cry out from “pain or desire” and a God who causes Job to suffer “because he is ruthless.” Kim Lozano writes about history in “At the Titanic Museum” but makes an imaginative leap from the minutiae of “replica dinner plates and deck chairs” to the lost “toddlers with tummies full of stewed apricots and currant buns” to her own children sledding “down the slope where the earth / is breaking through under the sun…their faces sparkling like glitter on water.” Nancy Reddy makes a similar leap in “Divine and Mechanical Bodies” between a troubled sister who grows “bird-boned and slender, a brittle core inside each inky feather” and a high school biology class in which “we pinned and bisected earthworms, diagrammed their tiny hearts / on worksheets.” There are many more poems worth quoting here, but it is the nature of an anthology to be incomplete and the nature of a review of an anthology to be even more so. I can only mention a handful of the poems collected by Elliott and Stephenson and, beyond that, urge readers to explore the book for themselves. As far as the questions about regionalism go, New Poetry from the Midwest doesn’t advance a strong position. The argument about literary geography that has made the most impact in recent years is Chad Harbach’s “MFA v. NYC.” He calls these opposing forces in literature “cultures” rather than regions, but his division does set up NYC as a locale against which everyplace else might be contrasted. More importantly, it makes me wonder if the MFA has become its own kind of region or anti-region. Whether or not you believe the MFA asserts a homogenizing influence on its constituents, it certainly scrambles aspiring writers to different parts of the country as they pursue education and elusive jobs in the professoriate. A poet who ends up in my home state of Missouri may have no connection there and may produce writing that bears no mark of the place, and I, living in Rhode Island, might just as well be writing from a room in Tallahassee or Salt Lake City. Writers have always left home to write about home, but the ways academia moves them around is very different from deliberate expatriation. One argument for MFA as a kind of non-region is the fact that the Iowa Writers’ Workshop, one of the country’s most venerable institutions for writers and smack in the middle of the Midwestern states, seems to have very little impact on this anthology. My cursory survey of the contributors’ notes suggests that only two of the eighty-two contributors have a connection to that program. One might expect Iowa to exert a strong influence on writers in the region, but actually graduates of the workshop come from and leave for everywhere, and their allegiances are probably not to the university but to the degree. 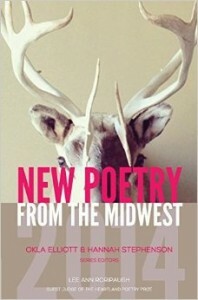 New Poetry from the Midwest is solid evidence of the vitality of poetry in these states, and it is well worth attention and repeated reading thanks to the many deep, beautiful, and strange poems within it. However, the title of the book and the editors’ introduction dodge, for the most part, the question about what is unique to contemporary poetry in the region. This is not necessarily poetry of or representing the Midwest, but poetry from a locale that may or may not be incidental to the writers who create it. The editors seem more interested in gathering a body of exciting poems and in calling attention to writing happening outside the acknowledged literary centers on the coasts than in creating a canon of contemporary Midwestern literature. Readers may ultimately thank them for that, even as we keep asking whether, or to what extent, geographical place still informs our literature in the age of the digital everyplace—and whether it matters. Stefanie Wortman’s first book of poems, In the Permanent Collection, was selected for the Vassar Miller Prize and published by the University of North Texas Press. Her poems and essays have appeared in the American Poetry Review, Michigan Quarterly Review, Copper Nickel, and other publications. Find her on Twitter at @frettychervil.